The sixth highest mountain in the world is Cho Oyu (8201m). Cho Oyu Expedition is a venturesome Himalayan climb and deems to be the easiest 8000m peak to climb through its Northwest Ridge, with no technical climbing, big snowfields, and little objective danger. Mt. Cho Oyu is easily approached by 4-wheel-drive vehicle from Tingri, often guided, and is the first 8,000-meter peak for most climbers. Cho Oyu is pinpointed 30km west of Mt Everest and straddles the frontier between Nepal and Tibet. From both Nepalese sides up on the south face and north-east ridge routes the climb is possible. Also Tibetan side along the Northwest ridge route with the North approach being an easier and a standard route, which was also the route of the first summit. The mountain Cho Oyu is climbable during both spring and autumn seasons. For the mountaineers who have thought to pie in the sky, Mt Cho Oyu Expedition has born out their dreams. It has the qualities of courageous and thrilling. In contempt of being the 6th lofty peak of the globe though projected as less problematic. Due to that characteristic, you can trace the successful attempt of the expedition in Cho Oyu. Ang Phri Sherpa became the first Nepali national to summit Cho Oyu on 29th April 1987.To complete expedition of Mt. Cho Oyu, we set up the Advanced Base Camp and then three high camps in the mountain. Thereafter starts our main attempt to scale the summit (8201m). We supply excellent mountaineering tents also for the high camps to our climbers of Mt. Cho Oyu. Bharal Adventure has catered the needs of mountaineers climbing Cho Oyu Expedition/Mountaineering in a professional and committed manner.Bharal Adventure offers you this amazing expedition just in 42 days.An amazing voyage is calling you.Let’s Go for it with Bharal Adventure. Day 02-03: Expedition Preparation day in Kathmandu. Day 04: Fly to Lukla(25min) 2860m. & trek to Phakding (3-4hrs)2622m./Monjo. Day 05: Phakding/Monjo – Namche Bazaar(5hrs) 3440m. Day 08: Dole – Machharmo (5hrs)(4,410m). Day 09: Machharmo – Gokyo Lake(5hrs) (4,750m.). Day 13 – 33: Climbing period for Cho Oyu 8201m. Day 38: Lukla – Kathmandu by flight and transfer to Hotel. We will be staying at Apsara Boutique in Kathmandu, teahouses during the trek and tents while camping. All accommodations are on the twin-shared basis. Single supplement is available in Kathmandu and lower parts of the mountain but may not be possible as we travel higher up the mountains. During our trip, we can enjoy Nepali, Tibetan, and Indian as well as the more common continental cuisines. Breakfast (only) will be provided during our stay in Kathmandu whereas all meals (breakfast, lunch and dinner) will be available during the trek and climb. While trekking, breakfast will be taken in the same place we stay the night. Similar arrangements can also be made for dinner. Lunch will be take on route to the next destination. During climbing sessions, hygienic, freshly-cooked food will be provided. There will also be welcome and farewell dinners in Kathmandu. Team composition is important to ensure safety and comfort of the climbers. 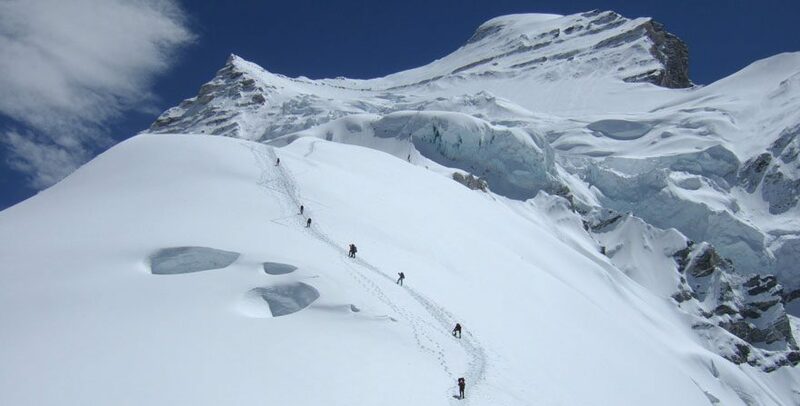 We observe high safety standards, therefore, for 2 International Climbers, we assign: BA Accredited Climbing Leader High Altitudes Assistance Sherpa Cook Base Camp Assistance and other necessary trek crew such Porters, Yaks and Yak man Because of our high safety standards, team members would be added as per the number of international climbers. Our Cho Oyu expeditions are led by experienced and professional mountaineers and guides who have scaled the mountain several times supported by other crew members and all the necessary logistics for the expedition. Not only in terms of qualification, but we also make sure that our leaders have proven track record in climbing high-altitude mountains. The number of guides is chosen according to the size of the team to maximize every individual climber’s chance of making it to the summit without compromising their safety. Our expedition leaders are also equipped with the expertise in handling altitude related problems including acute mountain sickness (AMS) symptoms. The crew members are experts in setting up tents and camps, melting snow on the route, cooking, and other daily needs. Since you will be in the remote countryside, you will be experiencing the early to bed and early to rise schedule. A typical trekking day starts at around 6 or 7 am. Enjoy the hearty breakfast and begin trekking. Carry your pack containing personal items you need for the day. The porters and yaks carry all the loads. Walk at your own pace, enjoy the scenery, chat with the natives, and take photographs. The lunch time depends upon the terrain and is prepared by our catering team. Generally you stop for lunch after about 3 hours of walking. The lunch hour also helps in acclimatization. The aim would be to reach next stop by the sunset. After reaching the overnight stay point, the crew members fix the tents. You may relax with a cup of tea or coffee or take a pleasure walk around the camp site. The dinner would be ready around 7 PM. Enjoy the dinner while sharing the day's experience with team members. The climbing itinerary may vary according to the climber's personal experience. A climbing day involves a steady climbing for 3-4 hours in the morning. After taking lunch rest and relax, there is a climb of 2-3 hours in the afternoon. However, flexibility in climbing itinerary is necessary as people climb at own pace and respond individually to the stresses of climbing. We ensure the ratio of climbers and Sherpa guides focusing on high safety measures so that each individual climber is able to progress at their own rate. The post-monsoon season from October to January is considered the best time form Cho Oyu Expedition. The lower valleys observe pleasant days, and it varies from cool to very cold high in the Cho Oyu. The nights may be quite cold due to chill wind. The oxygen level around 8,201m is only 35% of what it is at the sea level. Temperatures may get as low as minus 25C above Camp 1. The possibility of bad weather such as snow, wind, and cloud should also be taken into account. Our Cho Oyu expeditions are led by professional and experienced mountaineers and guides supported by other staff. Cho Oyu offers a perfect training opportunity for those aiming for more technical and higher mountains. The difficult terrain and a very high altitude indicate that the climb would be a challenging one. The climbers need to feel confident and comfortable ascending or descending on fixed ropes along the steep technical terrain preferably having prior experience on rock and ice climbing especially above 8,000 m. The oxygen level over 8,000m is only 35% of what it is at the sea level. Therefore, a high standard of physical and mental fitness is also necessary for the climb. Most of the expeditions to Cho Oyu are operated during the pre-monsoon season from March to May and the post-monsoon season from September to November. Carry a light 35-50L rucksack with your personal belongings that you may need handy such as camera, hat, glasses, gloves, sun creams, first-aid kit, toothpaste/brush, soap/ towel, and other personal items. Keeping yourself hydrated all the time during trekking and climbing is very important for your performance and well being. Therefore, always remember to carry water container with at least 1 liter of water in your backpack. The porters and yaks carry all your heavy gears and luggage. While Trekking from Lukla, you can wear a T-Shirt and trousers. You will need your down jacket around base camp until the sun hits camp after breakfast. Above the Base Camp, carry also ice axe, crampons, sleeping bag, snacks in your rucksack. The Sherpas carry other heavy items and gears in the mountain. This is the first day when you will step in the land of Nepal.After your arrival in Kathmandu airport,you will be picked up by Airport Picking Team by Bharal Adventure.You will be warmly welcomed by Bharal Adventure as you are going to experience this amazing expedition with us this time.After your welcome program, you will be transferred to the booked hotel or accommodation by Bharal Adventure. This is the second day of our journey.This day as we will be preparing and discuss our further team work regarding the expedition you will be explained everything in detail by Bharal Adventure Team.You will be clarified what type of journey we are heading for.What type of difficulties you will face and what would be the major solutions for them.Next day, we will have a free day after the discussion ends.And if you want then we will be visiting several World heritage Listed wonders in Kathmandu like Kathmandu Durbar Square, Bouddhanath, Swyambhunath and Pashupatinath Temple and also have required shopping for the expedition for your personal requirement. Our journey starts formally today.We will have the quick flight of to Lukla from Kathmandu Airport.After we reach to the land of Lukla we will have the opportunity to evaluate several beautiful scenes and have the panoramic views.After a short break then we will head towards Phakding.Slowly and gradually we will have an adventurous hike to Phakding and stay there for moving our journey ahead next day. After a test trek to Phakding we will have breakfast early in the morning and move ahead to onserve Sagarmatha National Park which is no doubt enough to steal your heart.Then we will hike up to Namche Bazaar which is also one of the fabulous places in Nepal. After luxurious hike from Sagarmatha National Park region and Namche we will have to rest today so that we could take our journey more effectively in further days. After regenerating our energy from the resting day we will move from Namche to Dole.In Dole we will be visiting various highlights such as Pasture Museu/Birthplace of Pasture ,Museum of fine Arts ,Forest of Chaux etc.And then go to over hotel for a sweet sleep. The trail starts up with scenic ridge above Dole and proceeds through amiable summer settlements and fascinating hamlet of Luza (4360m) along the Dudh Koshi Valley towards Maccherma, the last major settlement on the way to Gokyo. This is also the place where the Khumbu people first sighted Yeti in 1974. A visit to Himalayan Rescue Hospital is scheduled where the team attends a lecture regarding the altitude sickness, its precaution and primary treatment. Climbing through a ridge Chorten, the team moves through Pangka (4480m) to terminal of Ngozamba Glacier towards Lake Longpongo on the bank of which is consigned the Lama footprints on a stone, passing through Lake Taboche Tsho towards the third lake by which Gokyo Village is settled. A relaxing lunch will be further rewarded with an amusing walk along Dudh Pokhari, the third lake. This day we will rest a little and move forward on our journey.Total 2 days is assumed For acclimatization, a hike to Gokyo Ri will be arranged on this day with the exciting prospect of visiting the other more mesmerizing lakes of the Gokyo Valley.This viewpoint is considered as one of the most preferred viewpoints in the world as it offers us almost all the viewpoint of Everest Region. Thonak Tsho and Ngozuma Tsho are the fourth and fifth lakes beyond which the base camp of Mt. Cho Oyu and Gyachung Kang being only a stone’s throw away. These are one of the biggest glaciers in the world. This day would be an exciting day.After observing one of the worlds greatest glaciers we will move towards Cho Oyu Base Camp where we will start our work for building up the tents so that we could spend our time enjoying the moments in Cho Oyu Base Camp. Today is the day when we will have to collect our strength and guts for the main purpose of the expedition.Today we will be steping forward our feet for climbing up the Mount Cho Oyu.We will enjoy the climb easily having fun,resting evaluating the beauty of Cho Oyu we will spend our 20 days as climbing period for Cho Oyu. After our memorable journey in Cho Oyu we will be cleaning Base Camp as it's our responsibility to keep them neat and clean as they are one the most valuable ornaments available in Nature.After finishing our sanitation Program we will return back to Gokyo Lake. An easy downhill walk from Gokyo along the Dudh Koshi River emerging out of the Ngozumpa Glacier passes through the lakes until the arrival of Phangka village. From Phangka, the trail descends below across a level terrace on the slope climb to the far side of the hill until it reaches the village of Macchermo from where it requires few hours to reach Dole. The steep descent to Phortse Tenga passing through Mong –La, Sansa, and Kyangjuma, the trail reaches Namche Bazaar where the days of exhaustion is relieved with hot shower and rest in the comfortable lodge. The steep downward trail is traced by wobbly legs tired from continuously battling the rocky terrain. The team follows the same trail as before. The team by now shall be warmed up and whatever sickness or sore throats they had been feeling shall pass by now. The final trek of the expedition ends after arriving at Lukla. The flight back to Kathmandu arrives early giving the guest time for planning a short excursion in and around the city or spending the day taking respite in their comfortable hotel rooms. In the evening, the last supper of the expedition is hosted by Bharal Adventure to cherish the successful closing of the journey. We will be celebrating our successful expedition this day. You will be provided a farewell party and we will be remembering our moments. We will share our experience with each other and prepare for your departure for next day. The journey of a lifetime along the Himalayas comes to an end on this day. We hope we could make you satisfied and hope we will be in contact in coming days too and have long-term relationships. We hope to see a smile on your face through the core of your heart. The guests will be accompanied to the airport by one of the representatives of Bharal Adventure approximately three hours before their scheduled flight takes off. Equipment allowance, daily wages of cook, kitchen boy & Liaison officer. Per Person 50 KG. Expedition equipment’s luggage or, barrels allowed for the expedition to Base Camp.